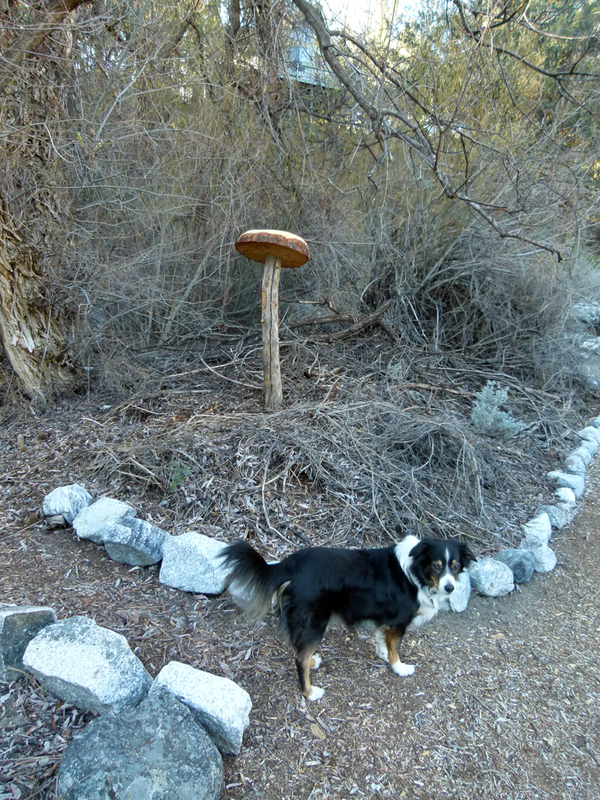 (1) ^ ^ ^ This decorative "mushroom" sprang up unexpectedly beside the pathway in March. 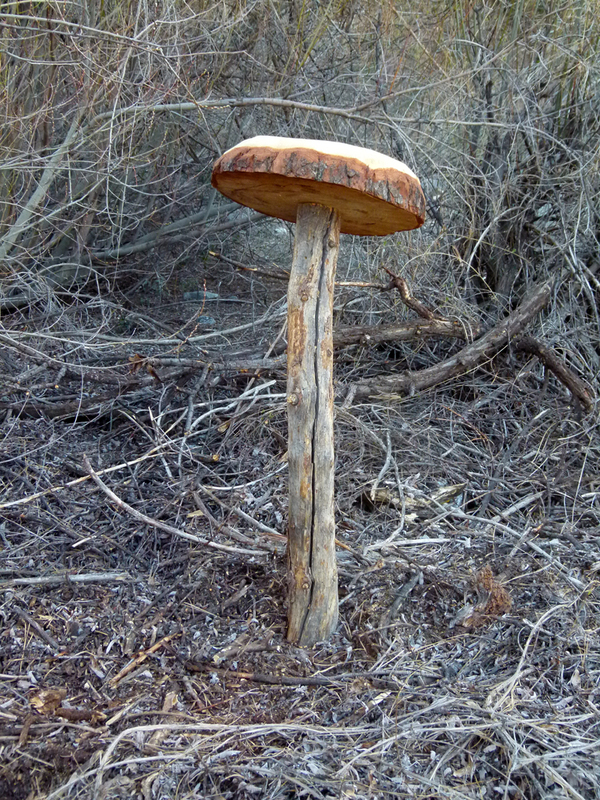 (2) ^ ^ ^ Karo's tall-stemmed mushroom (just for fun). 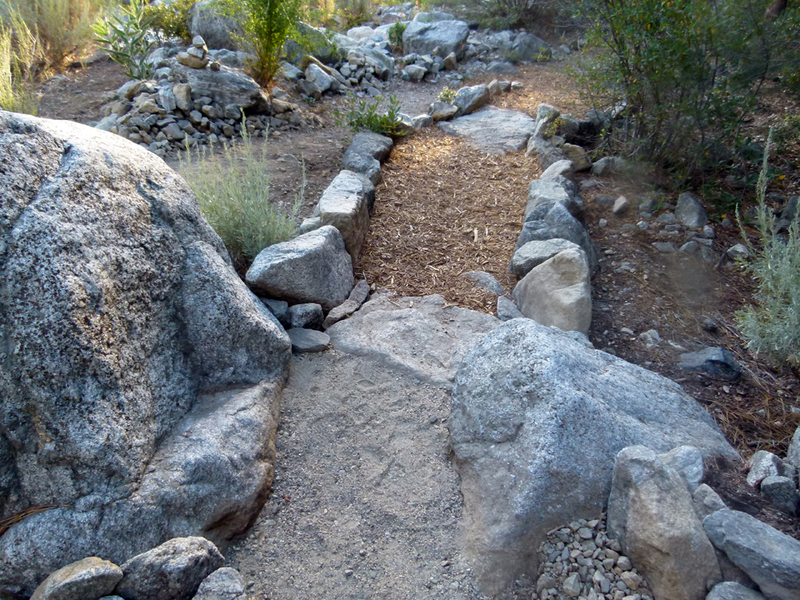 (3) ^ ^ ^ The top of this large bolder lay buried part way across the pathway protruding a couple of inches above the ground. This meant people had to either step on, over, or around it, as they passed by. 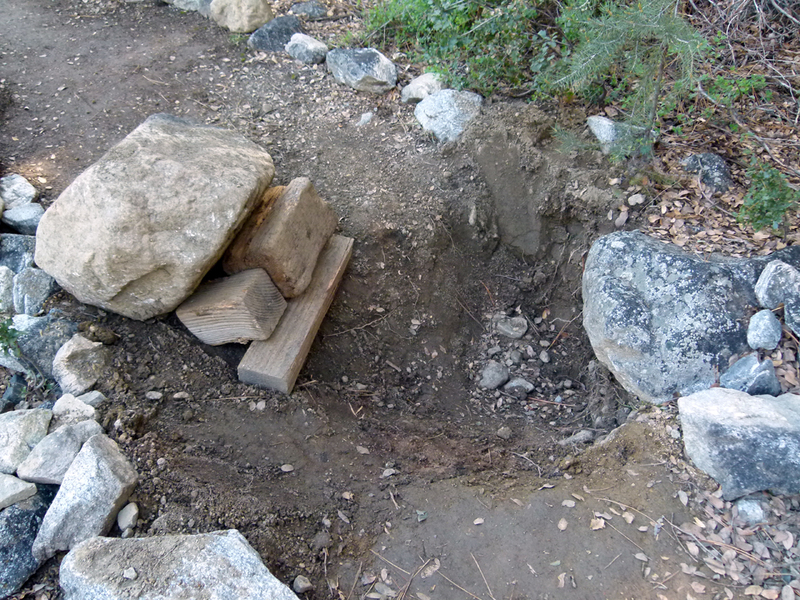 In the interest of public safety, the boulder was excavated and moved to one side of the path to prevent somebody accidentally tripping over it, especially in poor light. 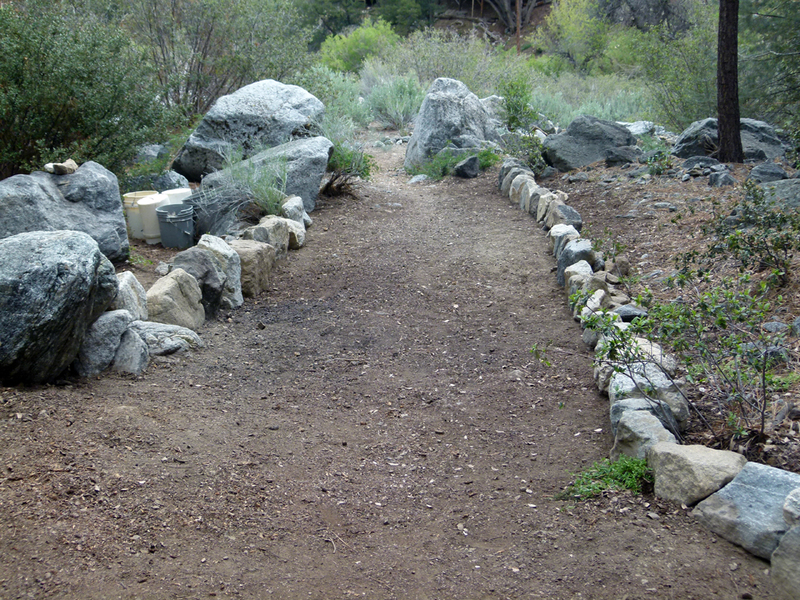 (4) ^ ^ ^ This stretch of pathway had quite a few embedded rocks, both large and small, sticking up above the surface of the pathway. Of course, it is safer not to have any unnecessary obstacles on a main thoroughfare, so they were all dug up and removed. 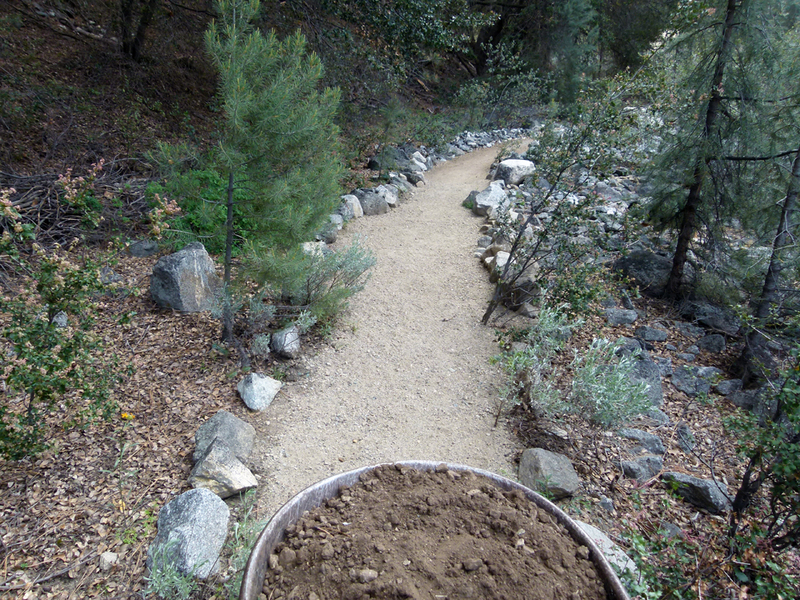 Wheelbarrow loads of soil were then brought in and spread out to make the pathway level and smooth. 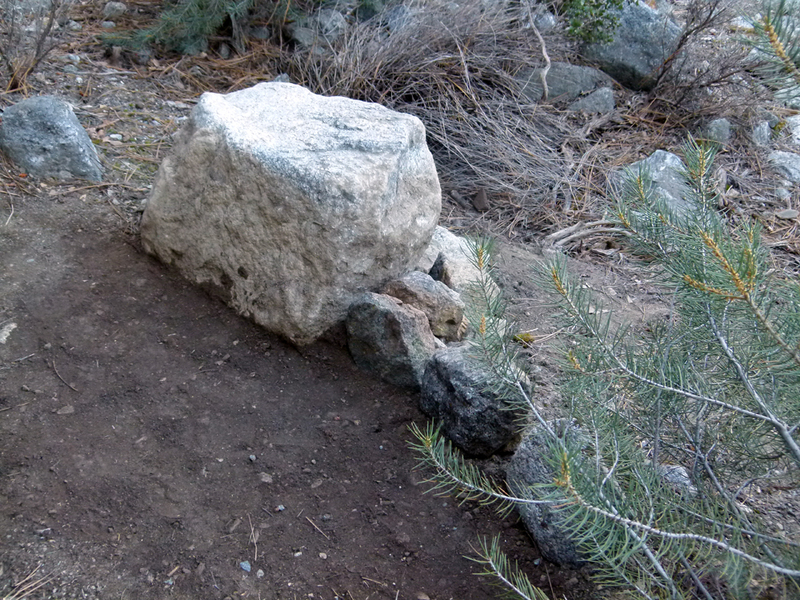 (5) ^ ^ ^ This large bolder, partially wedged under another rock, was the most stubborn obstacle in this section. (6) ^ ^ ^ As far as I know, nobody has ever stumbled on this slightly uneven surface, but, of course, it is better to be safe than sorry. 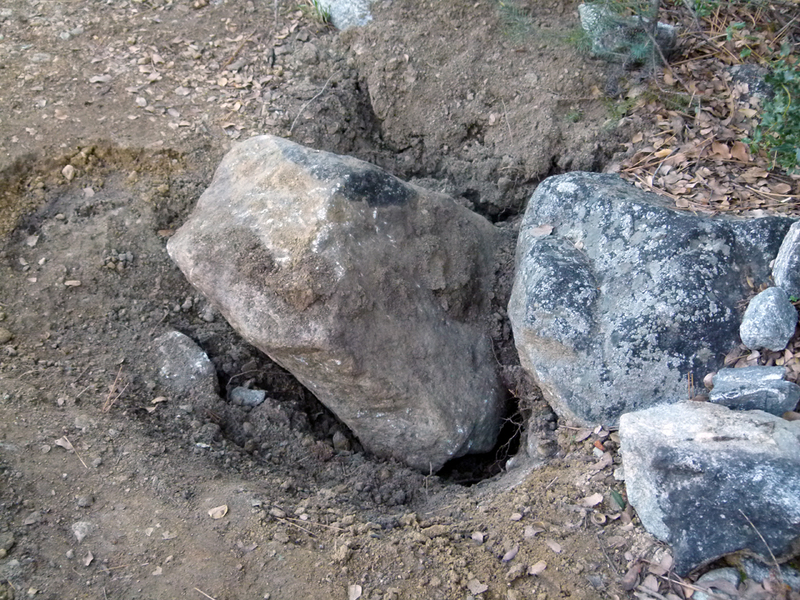 (7) ^ ^ ^ Now the boulder has been removed, the hole it was residing in will be filled in leaving little evidence it was ever there. 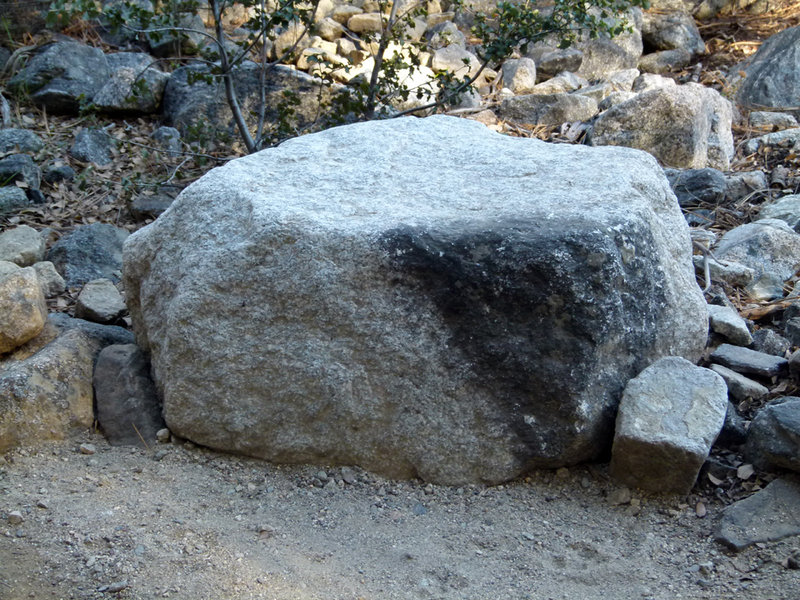 (8) ^ ^ ^ The dark colored "cap" you see on this boulder (facing camera) was the "tip of the iceberg" sticking out above the ground. 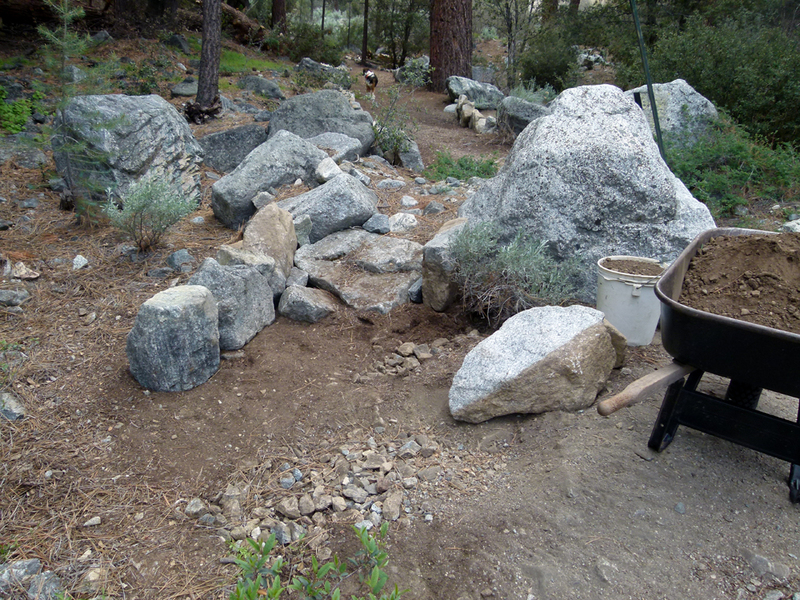 You can never tell how big these rocks will be until you start digging. 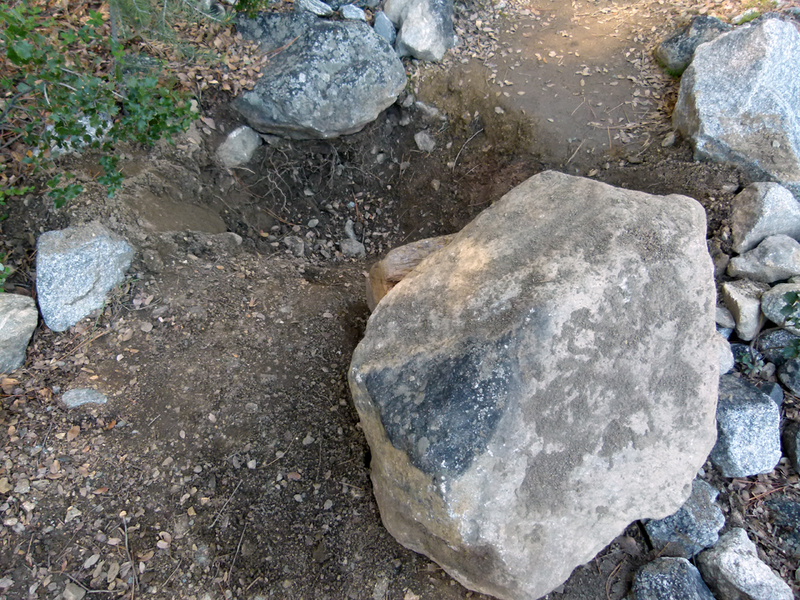 (9) ^ ^ ^ The boulder was turned into a seat beside the trail. (10) ^ ^ ^ After all the holes were filled in and the surface made level and smooth, a layer of fine gravel was spread on top. This is designed to prevent the trail getting muddy after rain so the mud doesn't stick to the bottom of your shoes. (11) ^ ^ ^ Guess what, in early Spring the mushroom had babies! (12) ^ ^ ^ One of the largest trees in the green belt and one of my personal favorites, suddenly turned brown last year. 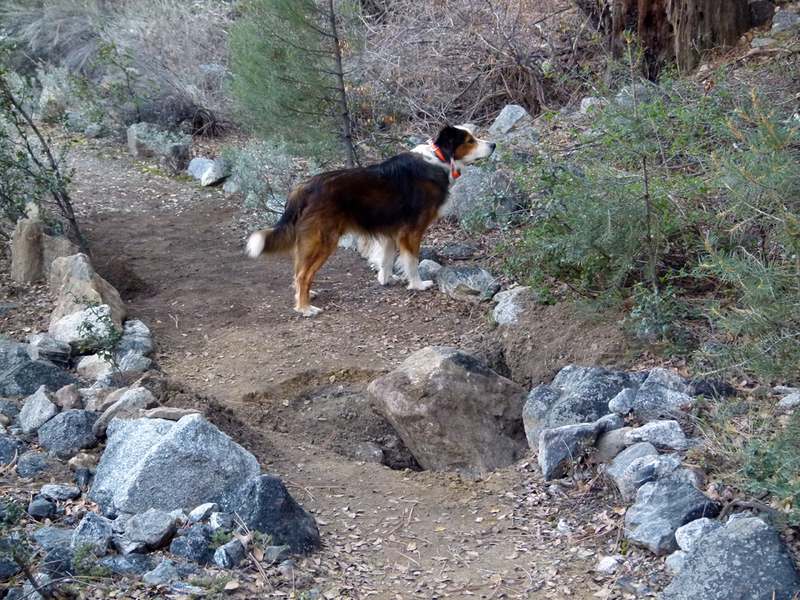 This tragedy was probably caused by the prolonged drought. 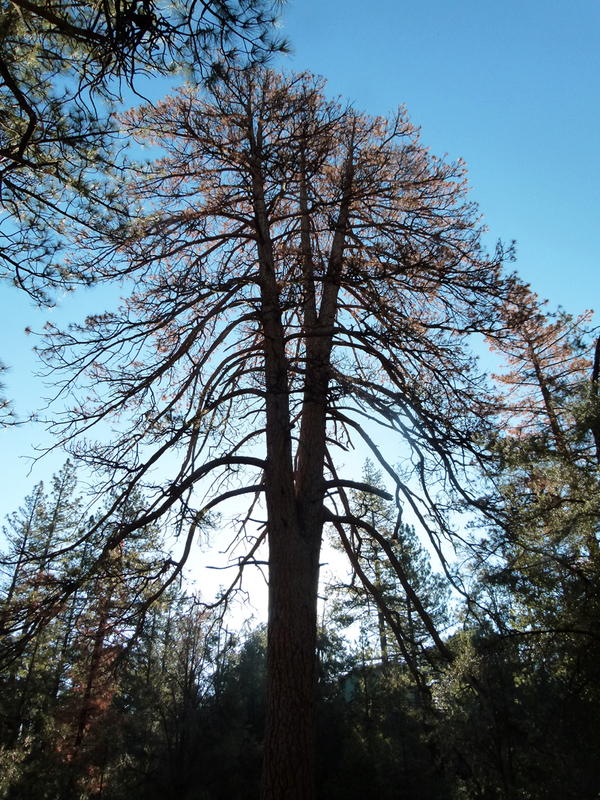 (13) ^ ^ ^ It is an unusual tree, not only because of its immense size, but also because it forks three times. 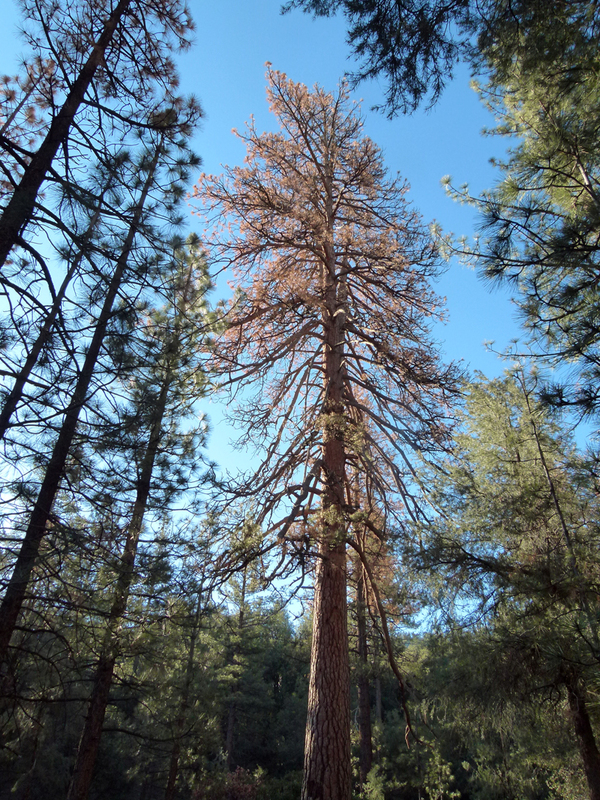 Triple-forking trees like this are relatively uncommon. 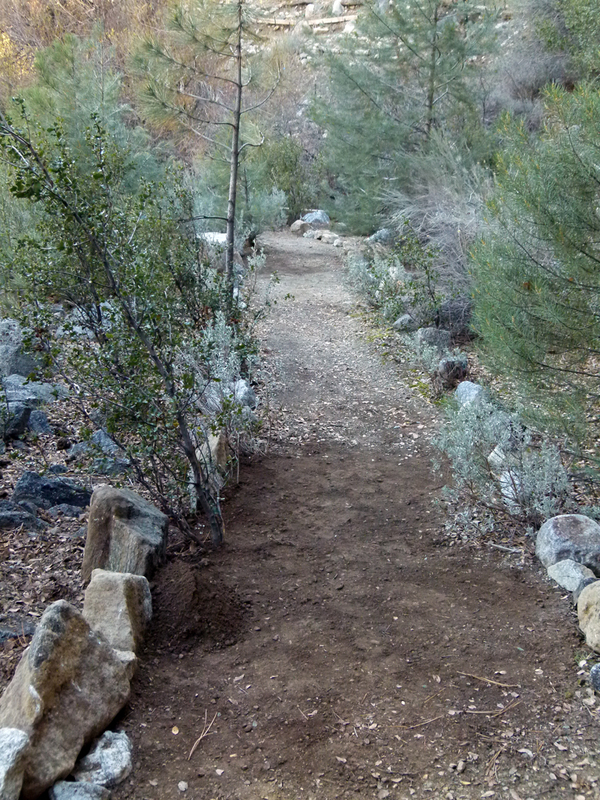 (14) ^ ^ ^ This pathway runs past the triple-forked beauty (above). 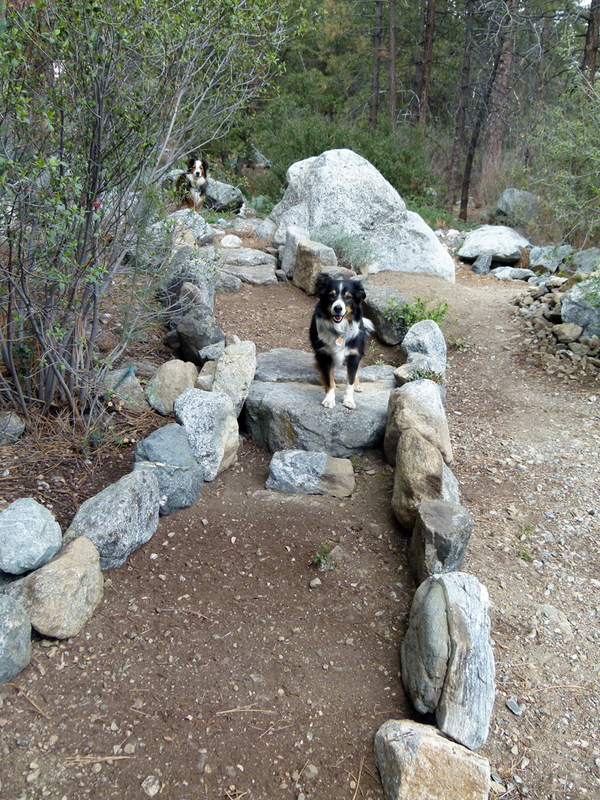 The design and construction of most of the pathways in this area are thanks to the ever energetic Jacqueline, with help from husband, Brian. (15) ^ ^ ^ This broken trunk is what is left of a double-forked, Jeffrey Pine that fell on the Snowflake house. Both forks fell during wind gusts but not at the same time. They fell about three weeks apart......to dramatic effect. 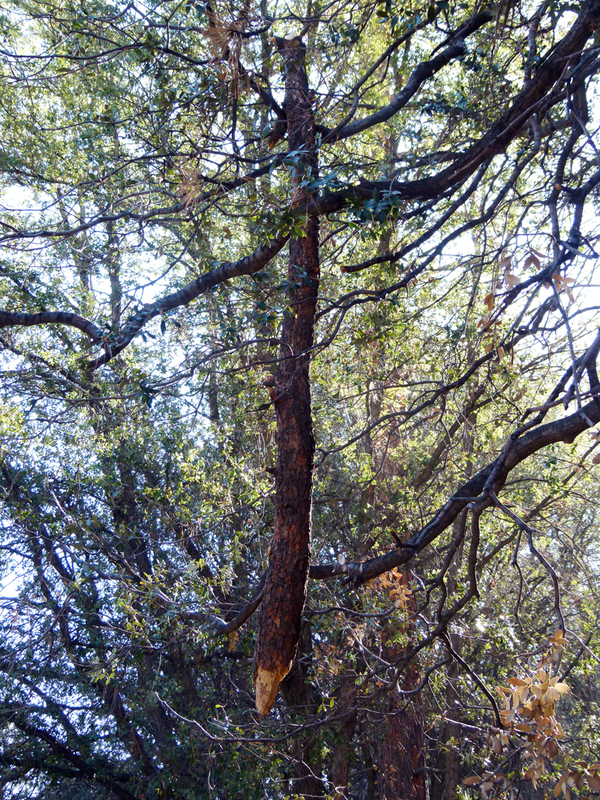 (16) ^ ^ ^ Two large trees were cut down nearby leaving this heavy, spear-shaped limb hanging precariously by a thread directly above the side of the trail where walkers pass by daily. When I dislodged the branch for the sake of public safety, it came crashing down with a mighty wallop. 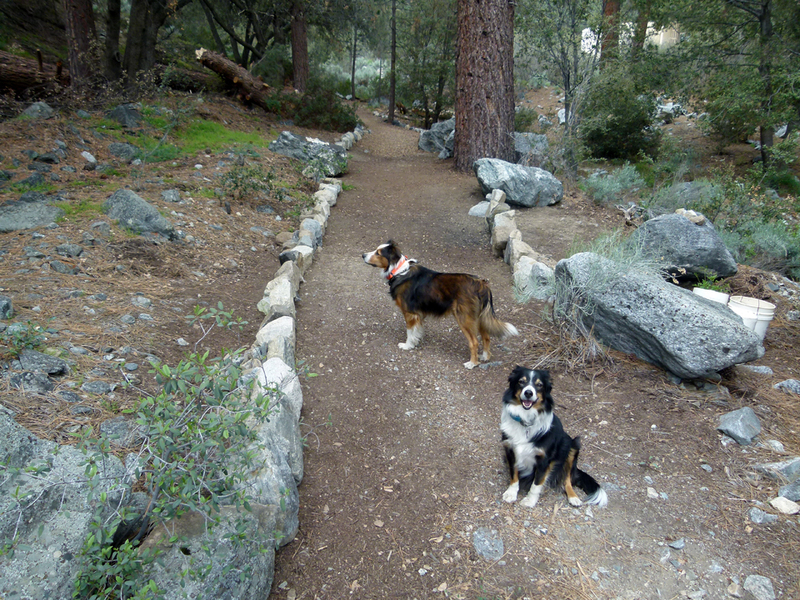 (17) ^ ^ ^ The next project was to extend this section of pathway completed last year, continuing it northward. The spot where this photograph was taken is right next to the place where the hanging branch seen above came crashing down. 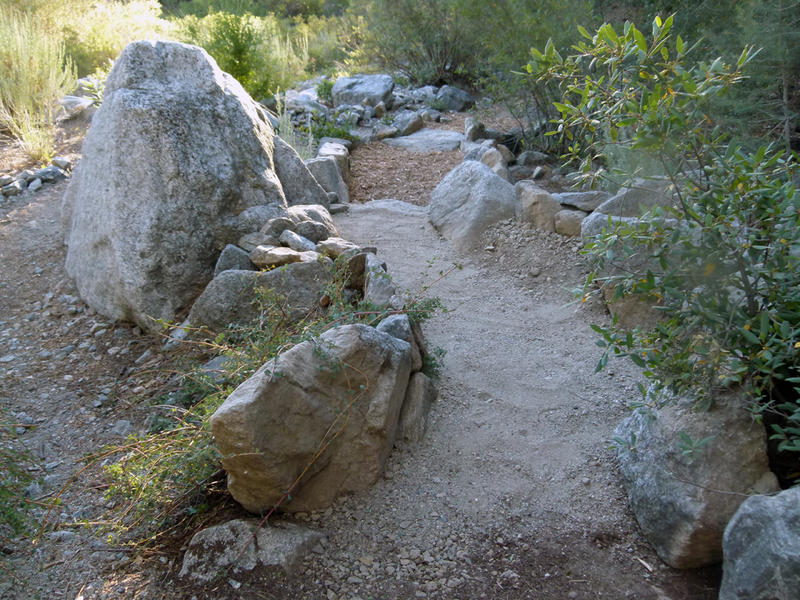 (18) ^ ^ ^ About 80 large rocks and boulders were transported here to complete this section. 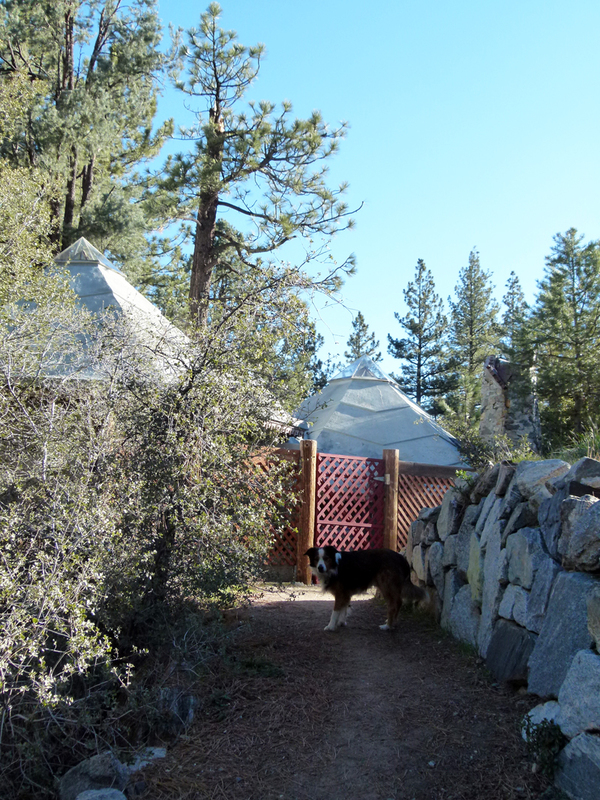 (19) ^ ^ ^ Additional reinforcing (as seen in the foreground) was added to prevent, or minimize, water damage from natural drainage run off in the event of flash flooding. 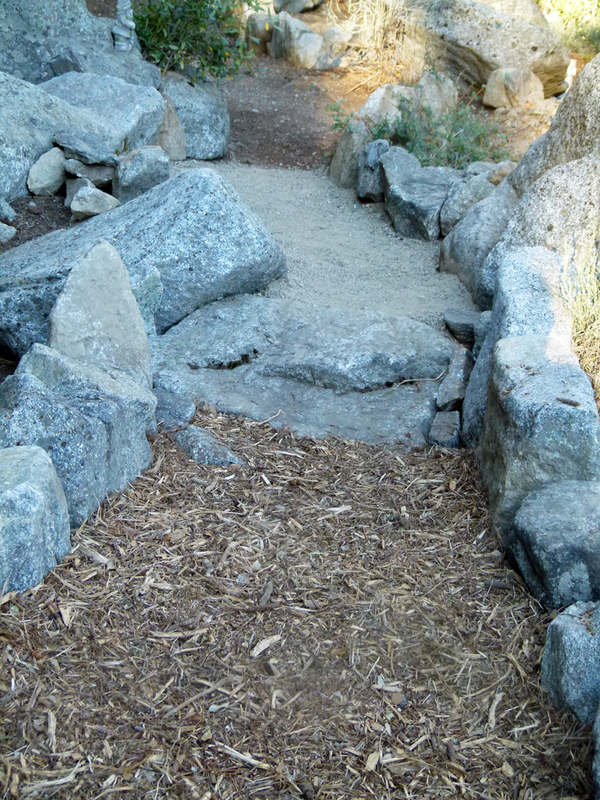 (20) ^ ^ ^ Another 30-foot section completed awaiting a thick layer of wood chips (aka slash). (21) ^ ^ ^ The new section features the "artists table". 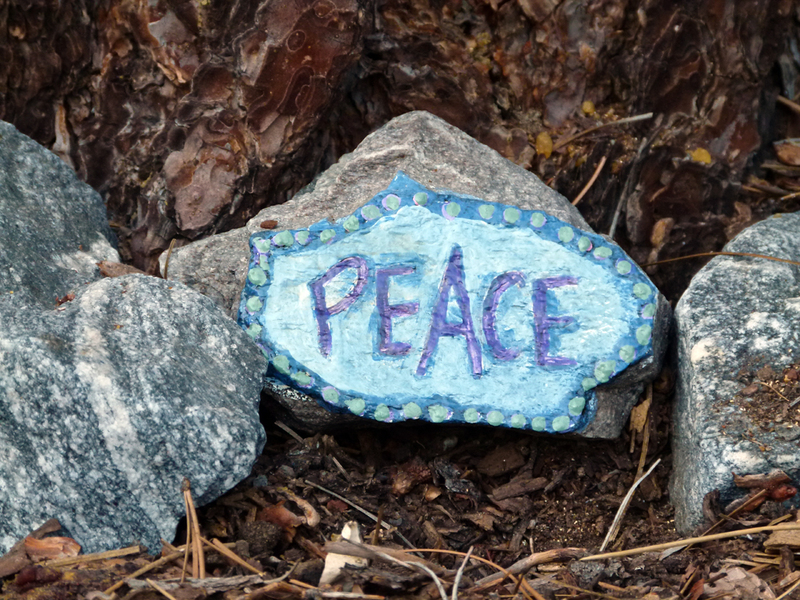 Izumi is inviting passerbys to pause a moment and create something from the quartz stones. Deanna loves horses and added this blue-eyed horse's head with bushy mane. 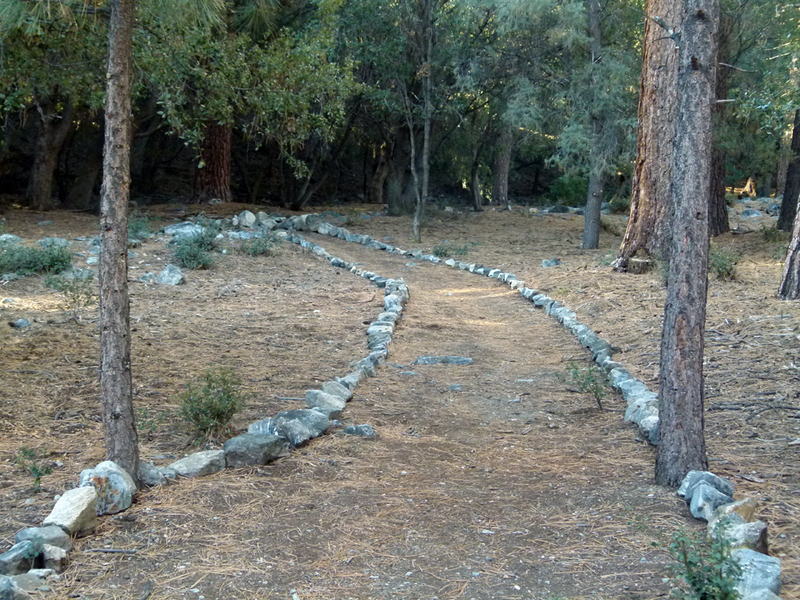 (22) ^ ^ ^ A further northward extension of this same pathway. 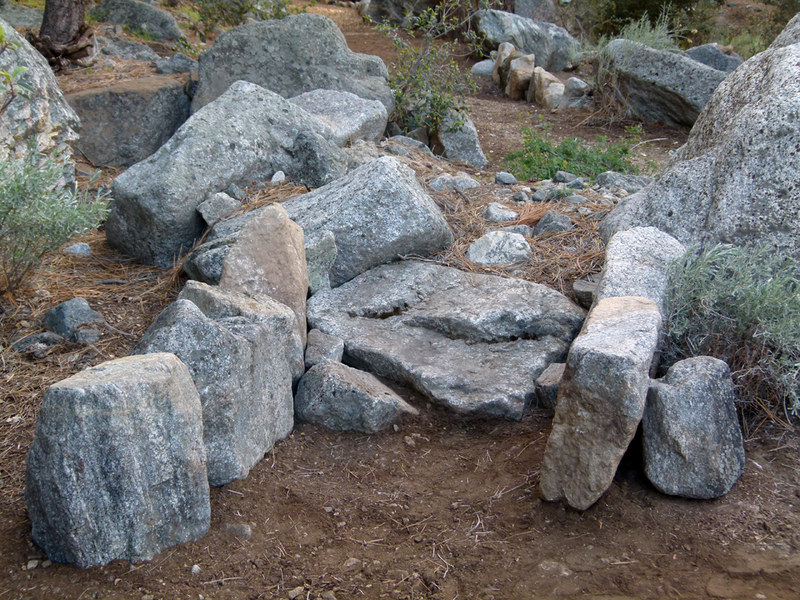 (23) ^ ^ ^ The idea of the design is to try and incorporate some of the larger, natural rock formations that would be otherwise difficult to move. 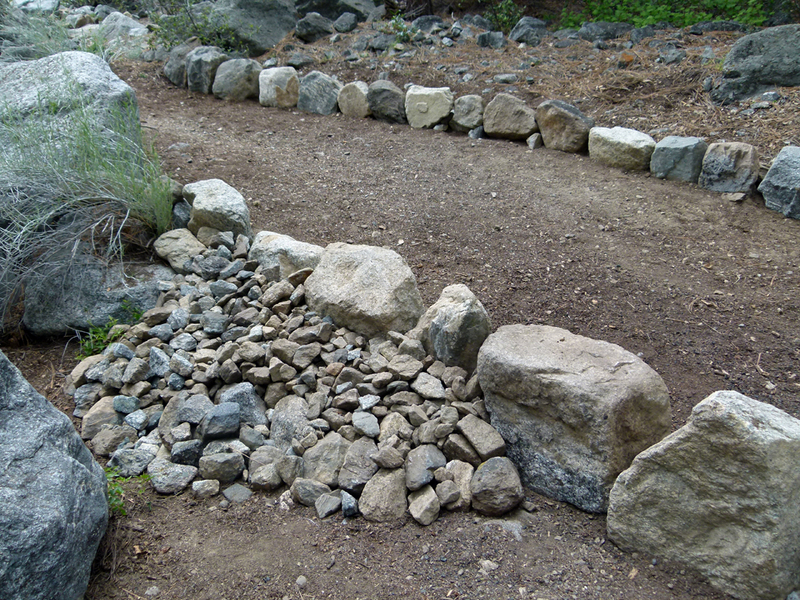 (24) ^ ^ ^ The rock borders for the new pathway in place. 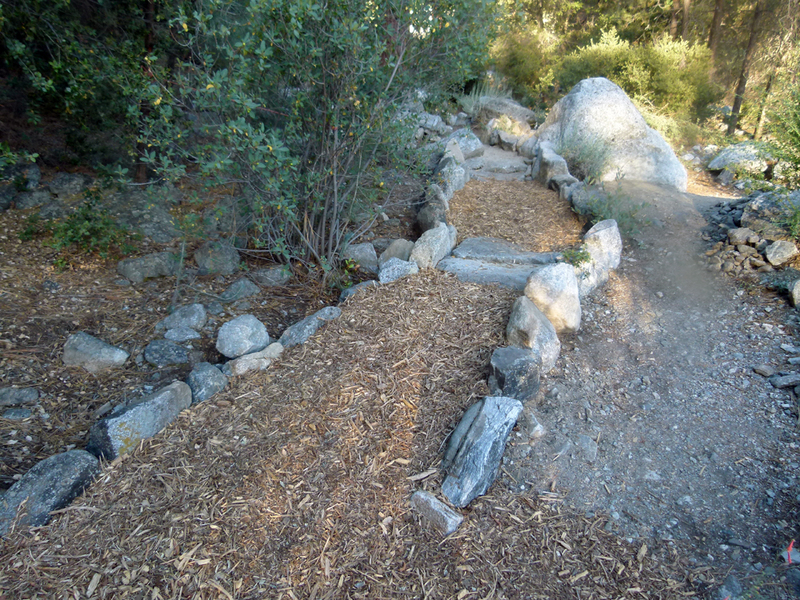 (25) ^ ^ ^ The pathway taking shape with the addition of wood chips. (26) ^ ^ ^ Looking back the other way (north). 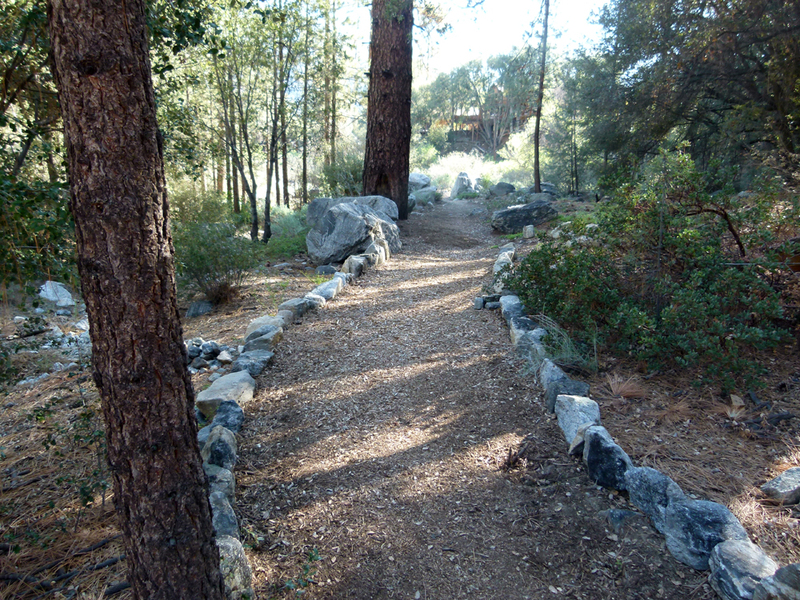 (27) ^ ^ ^ A combination of both wood chips and fine gravel were used to surface the pathway (looking south). Both materials have proven to be long-lasting and very low maintenance over time. (28) ^ ^ ^ Looking north again. 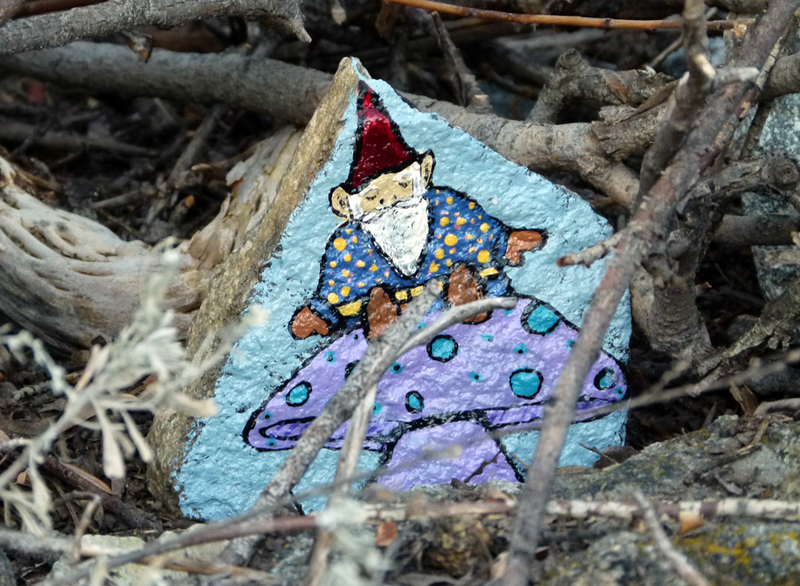 (29) ^ ^ ^ The tradition of the gnomes in the greenbelt was started several years ago by people like Toni Devereaux and Maxine Cameron Stenstrom from The Old Bear B&B. Kids were absolutely thrilled and delighted when they discovered these gnomes "hiding" in semi-concealed places near the pathways. The idea was to make it a dynamic, hide-and-seek game that was forever changing. 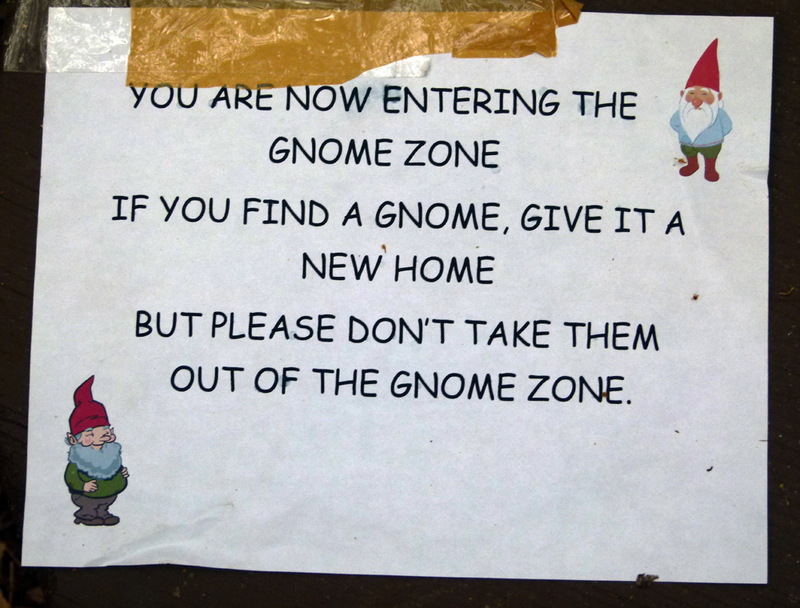 So when kids (or adults) found the gnomes, they were encouraged to move them to a new, semi-concealed spot for others to discover. That kept the hide-and-seek game alive and interesting...since every outing along the Snowflake pathways was potentially a new expedition of discovery. 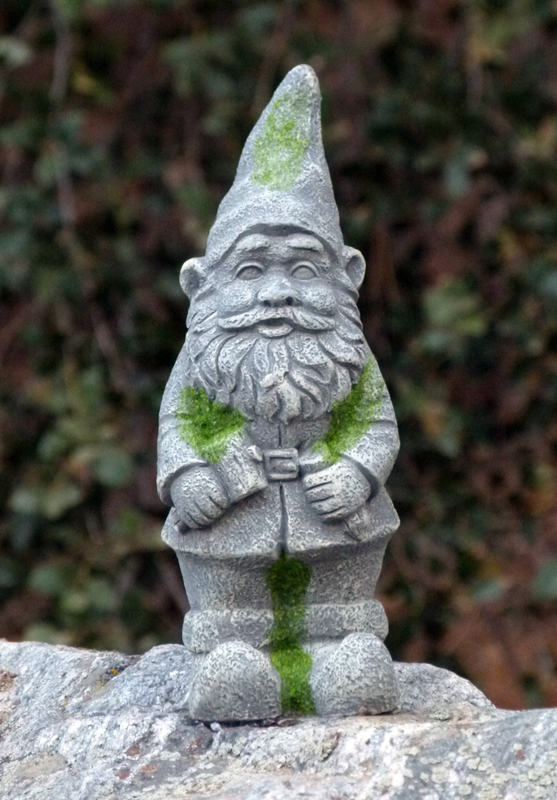 I notice all of the most recent gnome statues being deployed in the greenbelt (like the one pictured above) are firmly glued to the rocks they are sitting on...I guess to discourage theft? 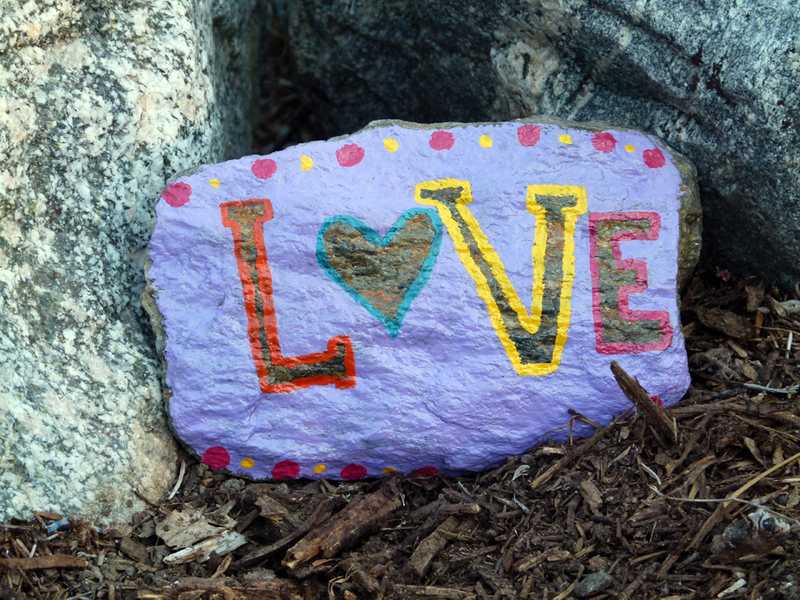 Nonetheless, it is still a lot of fun to find them and point them out to your strolling companions. 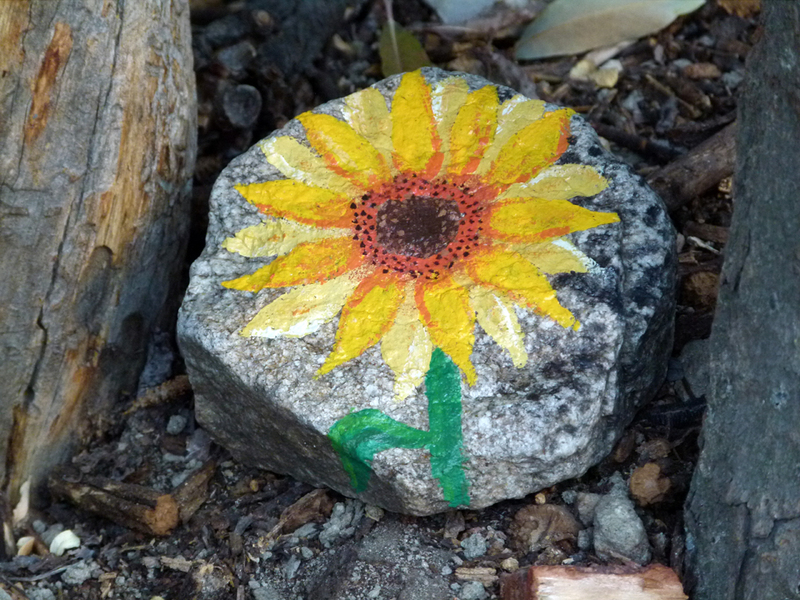 (31) ^ ^ ^ An artist is painting directly on rocks and placing the pieces at various vantage points along the Snowflake pathway that heads south going uphill towards the two PMC water tanks #C and #D). 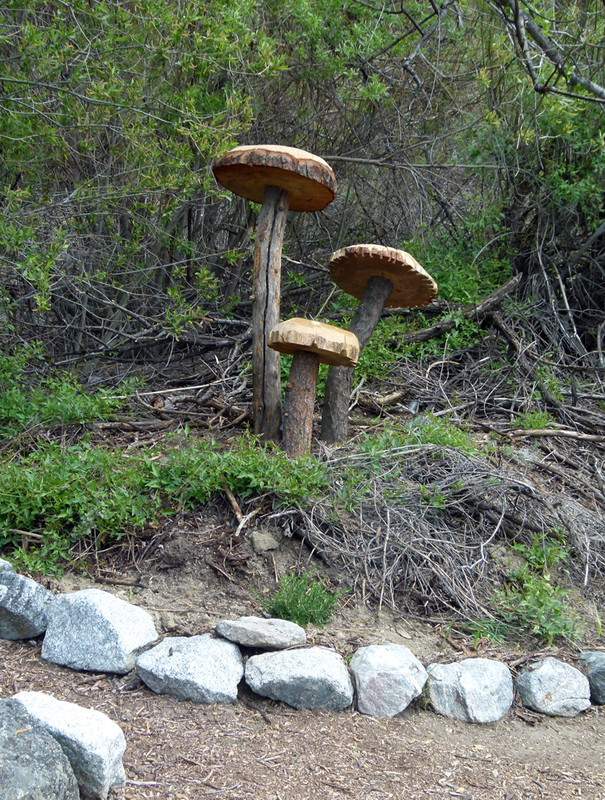 (32) ^ ^ ^ Rock artwork at the base of the three wooden mushrooms. (33) ^ ^ ^ Rock artwork opposite the "artist's table". 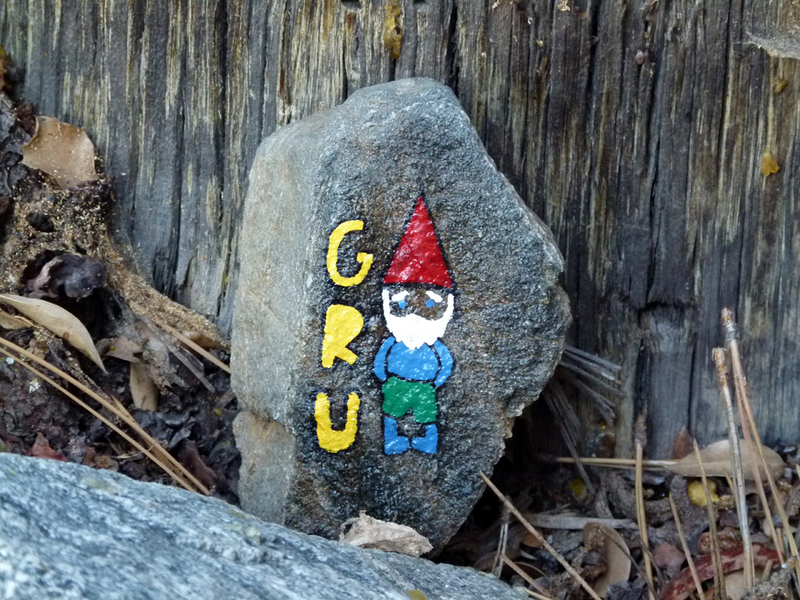 "GRU" might stand for Gnomes Are Us but that is just a guess. 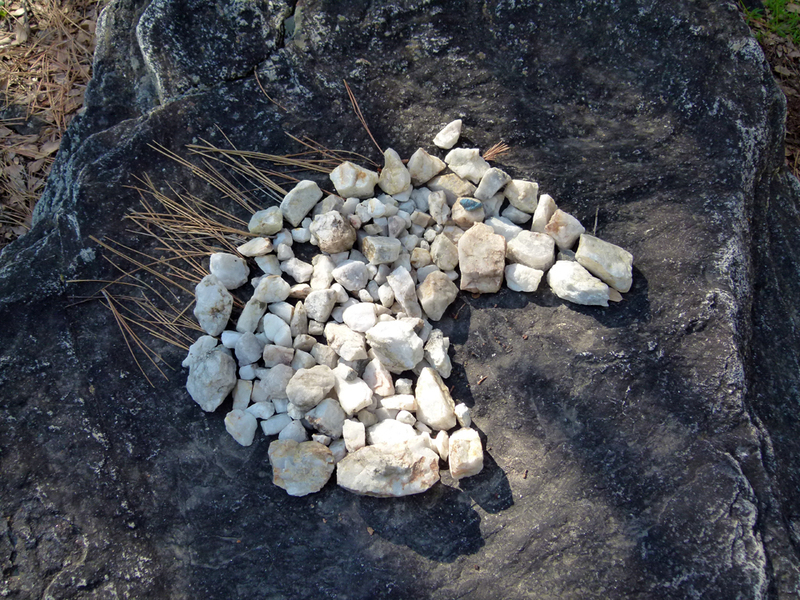 (34) ^ ^ ^ Rock artwork in the circle that surrounds the Victory Table. (35) ^ ^ ^ Rock artwork near the Victory Table roundabout.